College students in technical programs often practice their skills at professional events. That is why the Northeast Community College Audio Projects II class helped provide support for the faith based event called Reboot. It was held on January 17th, at the Norfolk Catholic Activities Center, Norfolk , Nebraska. The audio students helped provide sound support for the event. The students set up microphones, audio mixing boards, speakers, and ran cable. 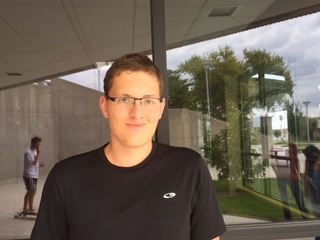 Ezra Brodersen, one of the students said, ” We just helped by setting up some line array speakers”. The students managed to practice their skills, and you can see them working to set up the audio equipment in the video below. The audio students sometimes get donations from events like these and they use the money to take trips to student conferences and the National Association of Broadcasters Conference in Las Vegas. Reboot is part of the Sacred Heart Parish revitalization, and is an effort to reboot the communities faith. It was hosted by internationally reclaimed author, speaker, and tv host Chris Stefanick.